Organizational Behavior in Sport Management fills a gap in sport management literature by exploring the key organizational behavior topics in sport organization settings. ...The text covers issues such as diversity, ethics, values, behavior, leadership, and much more. ...Organizational Behavior in Sport Management presents classical research in organizational behavior as well as up-to-date knowledge from the field of sport management. 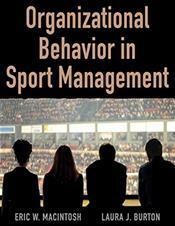 The authors offer information on individual, intrapersonal, interpersonal, and organizational processes that are fundamental to working within a sport organization, placing equal emphasis on what managers of sport organizations need to understand about human behavior and what each person brings to the work situation in terms of his or her own attitudes, thoughts, perceptions, and skills. ...The authors emphasize empowering employees and understanding their needs and desires regarding work, as opposed to managing employees in one particular way. With this in mind, the authors discuss the roles of sport organization administrators and executives, volunteers, employees, and players and coaches of sport teams, exploring how they behave independently as well as how they interact with each other. ... Organizational Behavior in Sport Management offers a foundational and contemporary look at the inner workings of sport organizations, providing numerous real-life examples from throughout the country and grounding students in the key behavioral and managerial issues that leaders, managers, and employees in sport organizations face today. As such, this text answers the key questions of why we do what we do at work, why others behave as they do, and how our interpretation of events and behaviors is subject to our own biases. In the process, students will gain an understanding of the most important organizational behavior topics and get a glimpse of how they could successfully function in a sport organization.